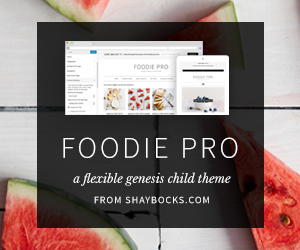 Foodie is very clean and sleek looking child theme for Genesis Framework. It follows minimal approach with major focus on contents. It is an ideal theme for food blogging resonating the theme name “foodie”. It feature dedicated recipe pages with integrated support for Easy Recipe Pro plugin. Additionally, it includes styling for 8 plugins including: Easy Recipe Pro, Genesis Responsive Slider, Pinterest Pin It Button for Images, Gravity Forms, Genesis Featured Widget Amplified, Genesis Enews Extended, Genesis Latest Tweets and Simple Social Icons. Cool theme to get started with yummy mummy food blogging. Disclaimer : We do not host any Foodie Wordpress theme torrent files or links of this Wordpress theme on rapidshare.com, depositfiles.com, megaupload.com etc. Foodie theme download links are direct full download from publisher site or their selected mirrors. This website contains Affiliate Links - it helps pay bills, thanks for the support! 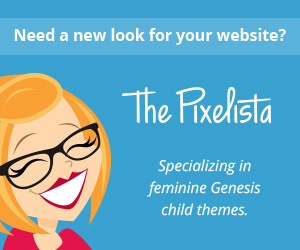 Edit Genesis Theme EASILY with Genesis Design Palette Pro. Non-coders love this!